The 62-year-old deputy foreign minister will need all his skills and experience if he is to help pull US-Russia ties out of the deep freeze. Moscow: Veteran diplomat Anatoly Antonov, appointed Russia's new ambassador to the US on Monday, at a time when ties are at dangerously low ebb, has the reputation of being a tough negotiator with a deep suspicion of Washington. But he is also a seasoned pragmatist able to adapt to sudden shifts in relations with the West. Outgoing envoy Sergei Kislyak has been at the eye of a storm over accusations the Kremlin conspired to get Donald Trump to the White House. But Antonov, too, comes with baggage, for he is on a European Union blacklist over Russia's intervention in Ukraine. Russian President Vladimir Putin on Monday formally appointed Antonov, suspending his duties as deputy foreign minister, and dismissed Kislyak via three simultaneous decrees, the Kremlin said in a statement. "Antonov is a hardliner, who understands the issues he talks about and knows the West quite well," said analyst Alexander Gabuev from the Carnegie Moscow Center. "He is a loyal supporter of the Kremlin line, but not a blind believer in conspiracy theories as many of his peers in the Russian military and intel community are." Antonov rose up through the ranks of Soviet diplomacy before donning a military uniform to become deputy defence minister from 2011 to 2016 at a time when ties with the West plunged to their worst levels since the Cold War. At the defence ministry, Antonov was often the stony public face fending off accusations over Moscow's actions in Ukraine and later Syria as an increasingly assertive Kremlin sought to stamp its authority abroad. On Ukraine he denied Russia had sent troops across the border and ridiculed accusations that insurgents and Moscow were involved in the downing of Malaysia Airlines flight MH17. The EU in February 2015 responded by slapping Antonov on a list of Russian officials under sanctions, including asset freezes and travel bans. After Moscow launched its surprise bombing campaign in Syria in support of President Bashar al-Assad, Antonov regularly fronted press conferences hailing the operation. He played a major role in attacking Turkey after Ankara shot down a Russian jet on its border with Syria, accusing leader Recep Tayyip Erdogan and his family of involvement in the illegal oil trade with jihadists from the Islamic State group. "The leadership and especially Erdogan won't resign and won't admit anything even if their faces are smeared in stolen oil," he was quoted as saying. 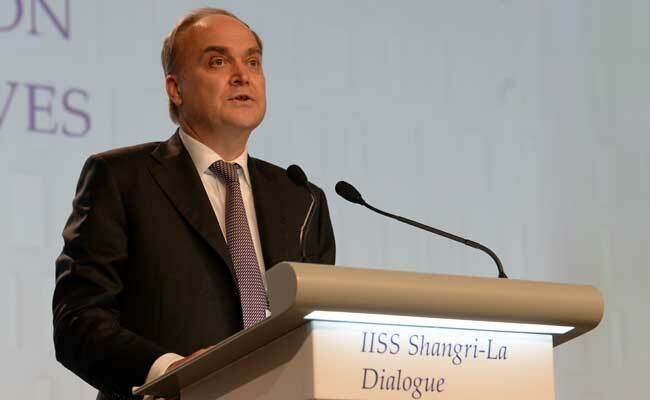 Antonov- who speaks English and Burmese according to his foreign ministry profile- has considerable experience negotiating complex weapons control issues with the United States. He headed the Russian delegation that agreed the New START treaty on nuclear arms reduction with the US in 2010, a brief high-water mark in ties between the US and Moscow. "The best words to describe the spirit of the talks would be 'mutual respect'. It is thanks to that mutual respect that our meetings were always businesslike and very productive," US negotiator Rose Gottemoeller said in 2011. "As Ambassador Antonov would frequently say, 'business is business'." Kommersant daily had reported that Antonov was being lined up to move to Washington before Trump's surprise election victory over Hillary Clinton. And despite his reputation as a hardliner Antonov insists Russia and the US need to mend ties- even if he remains convinced it should be on Moscow's terms. "There is a big job before us- getting out of this slump. But no one is talking about giving in," Antonov said after a parliamentary vetting hearing in May. "We need to convince our American colleagues that friendly, equal, respectful relations are in the interests of the people of both Russia and the US."